The specialist we’ll send to you is a fully equipped electrical technician which means a highly qualified electrician will help you with even the most complicated electrical maintenance and repairs. You can be 100% certain that the pro will figure out what went wrong and how to fix it. Fantastic Handyman works with a London team of reputable electricians, qualified for each and all types of domestic electrical services. From socket installation to complete or partial rewiring, the fantastic handymen will have it fixed. Each electrical technician carries public liability insurance for a minimum of £5 million and thus guarantees you a trouble-free handyman service. Transformers, cables, sockets… we can fix it for you! Rest assured that your electrician can do everything required for a job done right. Eventually, he will be able to figure out where the fault lies and fix the problem for you. Any extra costs will be added to your detailed bill after all handyman services are fully complete so you will know exactly what was done as part of your service. We charge only for the actual time it takes for the electrician to carry out a job. The minimum time for an appointment is 1 hour. Every additional half an hour is charged. These charges are for handyman labour only and do not include extra materials or additional expenses such as congestion and parking charges (unless a parking permit for the duration of the visit is provided). The electricians bring all tools necessary for each job. The handyman equipment includes a range of manual and power tools as well as various tall ladders (2-3-4 meters), in order for an electrical technician to deal with problems at the most out of reach places. This way the specialists can perform electrical test inspections, diagnostics and fault-finding on the electrical system of any property. Your London electrician will make sure to not cause any disturbance while maintenance and repairs are being done. He will leave his work area clean and tidy. 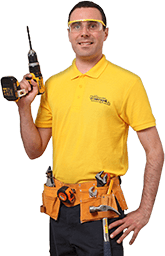 Your Fantastic Handyman will be more than happy to answer any questions you might have, along with friendly advice on how to keep the electrics at your home working properly. You can easily book your electrician by filling the online booking form. Alternatively you can download the GoFantastic App and hire your handy man in 30 seconds. The app allows you to find, combine and book other handyman services for your home. You can also contact us for any and all your questions via phone or chat.